—or, Who said 'as they say'? —or, it's too bad because Croce actually smoked cigars. There are any number of encyclopedias of quotations. I particularly like lists of misquotes —that is, expressions that everyone (except me) cites incorrectly: for example, it's not "Money is the root of all evil," but "The love of money...etc." (1 Timothy 6:10). Churchill did not say "blood, sweat and tears" but rather "I have nothing to offer but blood, toil, tears and sweat." *1 And detective fiction's greatest sleuth Sherlock Holmes never said "Elementary, my dear Watson." (It was close, but no cigar.) (I stress "fiction" because a recent poll in Britain shows that a lot of people apparently think Sherlock Holmes was a real person: "Dude, like he's the guy that caught Bob the Ripper! Awesome!" There are also many cases of accurate quotes attributed to the wrong person. I have had at least one German tell me that "To be or not to be" was by Goethe, and the other day a Neapolitan woman told me that it was by Luigi Pirandello. The expression "Naples is a paradise inhabited by devils" is in this category somewhere. Who actually coined the phrase? No one knows. Really, it's that simple. It's amazing, though, how many Neapolitans assume that it must have been Goethe. There are B & B's along the Amalfi coast that have in their promotional literature: "As Goethe once said, 'Naples is ...etc.etc.'." Letters to the Editor in newspapers are pretty much the same thing: "Goethe once said about our city that..." They all know that he wrote a long-winded travelogue called Italian Journey (Italienische Reise) and that he said witty things about Naples, so he must have said that thing about paradise and devils, no? I don't know if Johann Wolfgang von Goethe ever uttered the phrase or maybe wished he had invented it, but he never wrote it down and —as absolutely no one ever once said in German (Zeig mir das Rindfleisch!—show me the beef!). 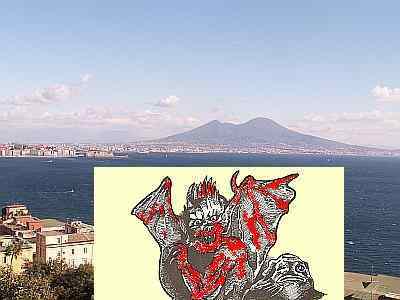 *2 In the entire Italian Journey, Goethe uses the expression "Naples is a paradise" only once and in a different context: on March 16, 1787, he wrote "Neapel ist ein Paradies, jedermann lebt in einer Art von trunkner Selbstvergessenheit. Mir geht es ebenso, ich erkenne mich kaum, ich scheine mir ein ganz anderer Mensch." ("Naples is a paradise. Everyone lives in a kind of drunken absent-mindedness. It happens to me, too. I barely recognize myself. I seem to be a very different person.") What can I say? That happens to me, too. I barely recognize myself. I seem to be a very different person. Goethe is stingy, in general, with the word "Paradise". Sometimes the trees outside his window are "paradise" and a certain "Angelika" is "paradise, but Johann is too much of a gentleman to expand on that and we are too discreet to press the issue. The only thing certain is that when Goethe and, a bit later, Mary Shelley were here, the phrase was current. It was on the lips of any and everyone on the so-called Grand Tour, but the phrase has a much older origin by at least a couple of centuries. Benedetto Croce, historian, philosopher and enthusiastic logophile set his considerable skills to work on the problem and produced a delightful book in 1923 called, of all things, Un Paradiso abitato da diavoli. *3 Croce has a couple of good leads, including a 1539 letter by Bernardino Danièllo (1500-1565), an Italian scholar known for commentaries on Dante and Petrarch, in which Danièllo says that nature, in order to make up for having granted the city such beauty, decided "di dare questo paradiso ad habitare a diavoli" ("...to give this paradise to devils to inhabit"). Croce has an even earlier reference to one Piovano Arlotto, (pseudonym of Arlotto Mainardi [1396–1484], a Florentine priest known for jests and facezie (witty anecdotes). *4 Arlotto wrote that the air of Naples is all good, but that the people are bad. If it weren't for the people, Naples would be a Paradise! Croce concludes inconclusively; that is, the expression probably arose in the 14th century among the "foreign" (that is, from northern Italy) communities of merchants in Naples. Even Croce's book causes confusion. In February, 2012, the choir now known as "I Turchini di Antonio Florio" (formerly called by the historic name, the Choir of the Pietà de’ Turchini) from Naples gave a concert in Hamburg called Angels and Demons, Comic and Serious opera in the 18th century. A blurb-promo for the concert traced the title to "Croce's phrase" that Naples was a paradise inhabited by devils. He didn't say that. I didn't either (although it is the title of this article). At least they didn't claim Goethe said it. All this reminds me that I had a friend in the army whose favorite quote was "I hate quotations. Tell me what you know." He was always quoting it. I don't think he understood the irony, especially since he claimed it was by Schopenhauer. (We were a well-read band of brothers. We threw books at the Commies in the Cold War.) Apparently, the phrase is by Ralph Waldo Emerson, but don't quote me on that. My thanks to Selene Salvi, a young lady who eats archives for breakfast!